Please read this page before promoting our service. Payments are made anytime, anyday upon request. Commission must be in good standing before payment is made. Commission is 0.5% on both buy and sell order for life time. 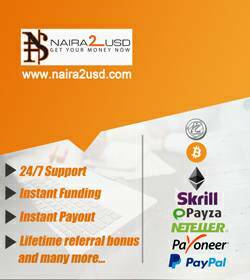 Payment is made to your by perfect money.Payment is done upon request inline with exchange rate on our website. We do not allow you to refer yourself. If you come in contact with an account that is referred. It will automatically fail. Copy and paste any of the affiliates links below to your website. Replace 'id' with your user ID. This can be found on your dashboard after you login.